Welcome back fellow stargazers and meadow grazers. Here we are again, with another list of predictions of your future. This week, they range from angels, to toenails, to cowboy boots. Whoa, we hope you will endure. Aries… Saturn is aligned with Mars now. That’s not a good sign. In the distant future, you will be known as a “model employee” after a witch turns you into a mannequin. Taurus… Mercury is in its third house now attending to a cable problem. That spells trouble for you. In the not too distant future, you will swat flies and mosquitos, or be swarmed by a SWAT team. Either way, it will be bloody annoying. Gemini… Venus is descending at this time and not liking it. That isn’t good for you. Someday, you will develop a way to grow fur on toenails. You will try it first. Unfortunately, the fur will migrate to your entire body. That will result in a hairy situation. Cancer…The Earth is trine with Cancer now. That spells trouble. One day in the future, you will become known for your loud, guttural sounds. People will shun you. 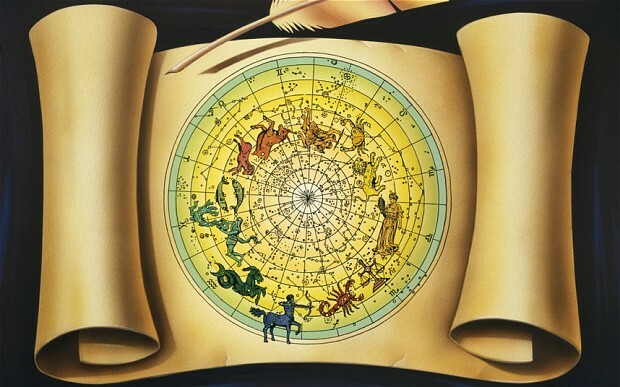 Leo… The Moon is in its seventh house decorating for a party. Things aren’t going well. That means trouble for you. In the distant future, you will spend all your time and money developing a sun blocker product to prevent sunburn from exposure to sunflowers. Unfortunately, you won’t sell any of it, losing all your money. Virgo…Neptune is tuning up for a recital and can’t get the notes right. That spells trouble for you. In the not too distant future, you will get a student loan, or get a loan on a student. Either way it will cost you a lot, but you’ll learn a valuable lesson from it. Libra… Pluto is in its fourth house cooking for a dinner party. Pots are boiling over. That’s not good for you. In the future, you will succumb to your uncontrollable desire to take part in a military maneuver with Dennis Miller in the cold rain and mud. Scorpio… Mars is descending into a bad mood now. That’s never good for Scorpios. Someday, you will be thought of as strange, and perhaps deranged, when you satisfy your urge to wear cowboy boots on your forearms. The spurs will injure your ribs. Sagittarius…The Sun is in opposition to Sagittarius at this time. That’s never good. In the not too distant future, you will have the urge to order all stand-up comics to sit down. You will be thrown out of several venues as a result. Depression will set in and you’ll lose your sense of humor. Capricorn… Mercury is in opposition to Capricorn at this time. That spells trouble for you. Somewhere, someday, your eyes will meet another’s eyes. Your eyes will then elope with their eyes, leaving you in the dark. Aquarius… Uranus is in its fourth house now having some plasterwork done. It’s not going well. That’s bad for you. One day, in the future, you will develop the face of an angel, but not long after, the angle will take it back just for the hell of it. Pisces… Jupiter is on the cusp of Pisces at this time. That spells trouble for you. In the not too distant future, you will awaken to find a miniature Hobbit living in your gerbil’s habit trail. They’ll never get along, causing you much grief and loss of sleep.